In Lab 2 we saw that our input transducers (microphone and photodiode) produced signals of only a few millivolts, while our output transducers (speaker and LED) required signals of a few volts. To make up this discrepancy, we need to amplify the signal levels produced by the input transducers. In Lab 2 we measured the voltage across the photodiode and found some fairly distorted waveforms. It turns out that the current produced by a photodiode is proportional to the intensity of the light falling on it, while the voltage is proportional to the logarithm of the intensity, hence the distortion. If we could produce an output signal proportional to the photodiode current, we would have a much better transducer. Wire the following circuit. (You can modify the previous circuit by removing the 10 k resistor and replacing it with the photodiode (connected to ground rather than to the function generator)). As you did in Lab 2, note the output voltage, , and observe how it changes as you cover and uncover the photodiode with your hand. Set the function generator to produce an 8 V p-p, 100 Hz triangle wave. Disconnect the BNC patch cord from the function generator output and connect the BNC clip leads. Connect your red LED to the clip leads (like you did with the photodiode in Exp. 2.3 Part 2. Hold the LED directly above the photodiode and observe . Is it less distorted than in Lab 2? Switch the function generator to sine wave and observe the waveshape. Switch the function generator to square wave and increase the amplitude to maximum. Slowly separate the LED from the photodiode, adjusting the alignment to maintain the best signal (just like Lab 2). What is the maximum distance you can get with this configuration and still get a recognizable square wave signal? How does it compare with what you got in Lab 2? The notion of a "recognizable" signal is clearly subjective. In subsequent labs, we will develop more objective criteria for having a "good" signal. Remove the BNC clip leads, reduce the amplitude of the function generator, and reconnect the BNC patch cord. Unplug the photodiode. 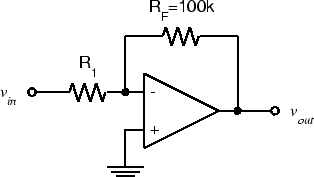 Analyze the transresistance amplifier using the op-amp design rules and convince yourself (and the grader) that really does equal . The microphone we used in Lab 2 is called a dynamic microphone. The one in Lab 3 is a carbon-button (or carbon for short) microphone. The output of the carbon microphone is close to our standard 1 V level, but for the dynamic microphone to be useful, we will need to amplify its output. If we don't mind the change of sign (which we don't for this application) we have just the circuit we need. We will use this circuit in several subsequent labs, so build it in a convenient part of the breadboard (see discussion in "Organizing your Breadboard" above) and leave it assembled when lab is over. Look back in your Lab Notebook to find the value you measured for the output voltage of the dynamic microphone. Calculate the gain required to amplify this to a 1 V p-p signal. 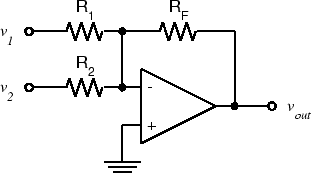 Calculate the value of that will give the circuit below the gain you found in Step 1. Wire the circuit (just add to the circuit from the previous part) and connect to J1-6-left (Pin 8 on the Interface Board socket strip). Plug the microphone into J1-6. Speak into the microphone and observe . Does it have the amplitude you expected? If not, adjust until is approximately 1 V p-p when speaking in a normal voice. We will want to be able to use both the dynamic microphone and the carbon microphone in the telephone handset. We could build separate amplifiers for each and switch back and forth, but it would be more convenient to be able to use either one (or both) with no changes to the circuit. Since KCL must hold at the negative input/virtual ground, if more than one current source is connected to it, the output voltage must be proportional to the sum of the currents. Consider the following circuit: A quick analysis shows that , i.e. the output is a weighted sum of the inputs. 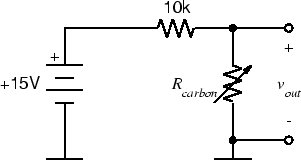 We can use this circuit as a mixer to amplify both the dynamic microphone output and the carbon microphone output by the appropriate amount and then combine them into a single signal. Plug the handset into J1-7. Speak into the handset microphone and verify that the above circuit works. Since we changed the voltage and resistance from last time, we need to recalibrate. Speak in the same normal voice you used for the dynamic microphone and measure the peak-to-peak amplitude of the signal. 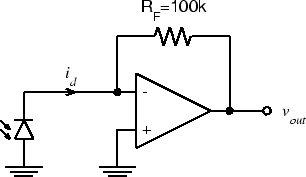 Compute the value of required to give an output of 1 V p-p and use it and a .1 F capacitor to create the circuit above out of the two subcircuits you already have. Speak into each microphone and verify that is about 1 V p-p in each case. Since the op-amp can drive a 100 resistance to more than our standard voltage level, and since the handset earpiece resistance is greater than 100 , we should be able to drive it from the op-amp output. Connect one side of the earpiece (Pin 11 on the interface board) to ground (Pin 14). Connect the other side (Pin 10) to . Have your lab partner speak into the dynamic microphone while you hold the handset to your ear and speak into its microphone. Verify that both voices are audible simultaneously. Do not disassemble this circuit. We will use it in subsequent Labs.